The scientific analysis of design thinking continues to burgeon and is of considerable interest to academic scholars and design practitioners across many disciplines. This research tradition has generated a growing corpus of studies concerning how designers think during the creation of innovative products, although less focus has been given to analysing how designers think when creating less tangible deliverables such as concepts and user-insights. 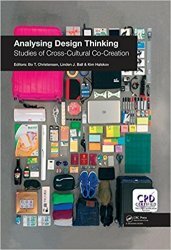 Analysing Design Thinking: Studies of Cross-Cultural Co-Creation brings together 28 contributions from internationally-leading academics with a shared interest in design thinking who take a close look at professional designers working on a project that not only involves soft deliverables, but where a central role is played by co-creation across multiple, culturally diverse stakeholders. This collection of detailed, multi-method analyses gives a unique insight into how a Scandinavian design team tackled a specific design task within the automotive industry over a four-month design process. All papers draw upon a common, video-based dataset and report analyses that link together a diversity of academic disciplines including psychology, anthropology, linguistics, philosophy, architecture, management, engineering and design studies. The dataset affords multiple entry points into the analysis of design thinking, with the selected papers demonstrating the application of a wide range of analytic techniques that generate distinct yet complementary insights. Collectively these papers provide a coherent framework for analysing and interpreting design thinking ‘in vivo’ through video-based field studies.